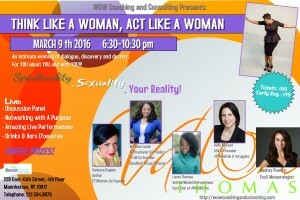 “THINK LIKE A WOMAN / ACT LIKE A WOMAN” – An Intimate Evening of dialogue, discovery & destiny! A very special evening specifically designed for you, about you and with you. Come out and be a part of our Live Panel discussion as we chop it up on the topics of “Spirituality, Sexuality & Your Reality” as it relates to women in 2016!